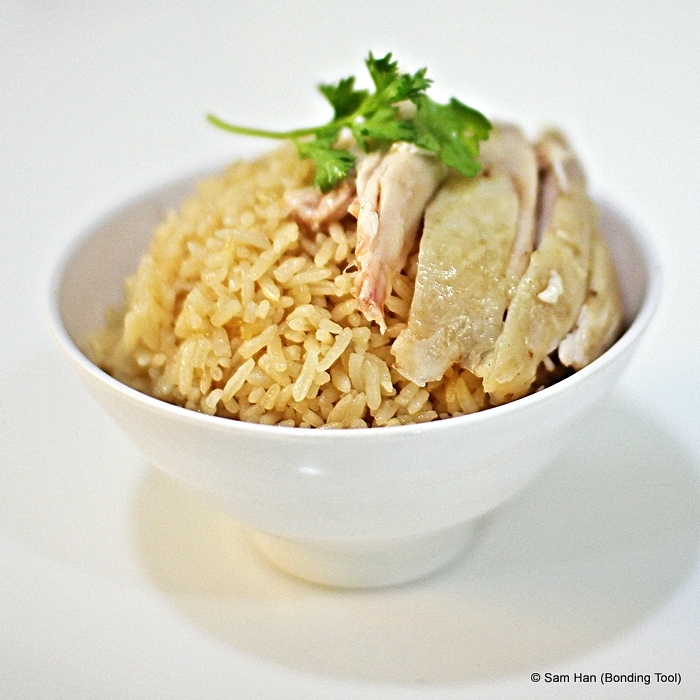 Smooth and tender steamed chicken with “gingery fragranced” and not so oily rice. 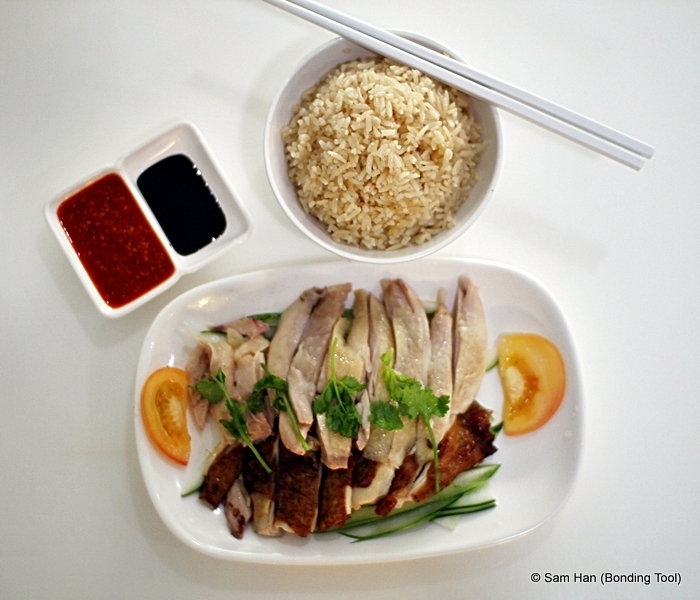 Chicken rice is one of Singapore’s national dish and The Big Bird Chicken Rice almost invariably pops up when the focus is on the chilli. 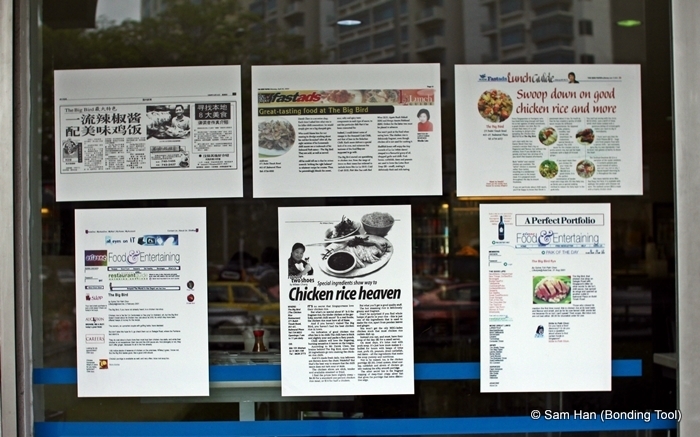 The Big Bird Chicken Rice Specialist – established since 1998. 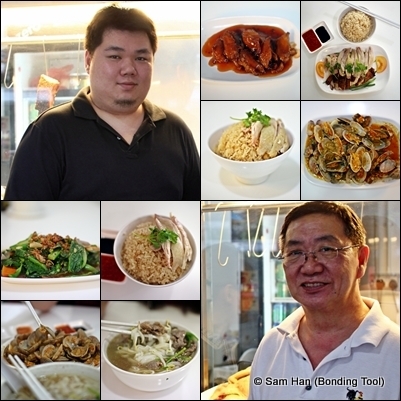 Derek Chen, the founder of The Big Bird Chicken Rice went into food industry with a partner then without much F&B experience and has today garnered his own flock of loyal customers. 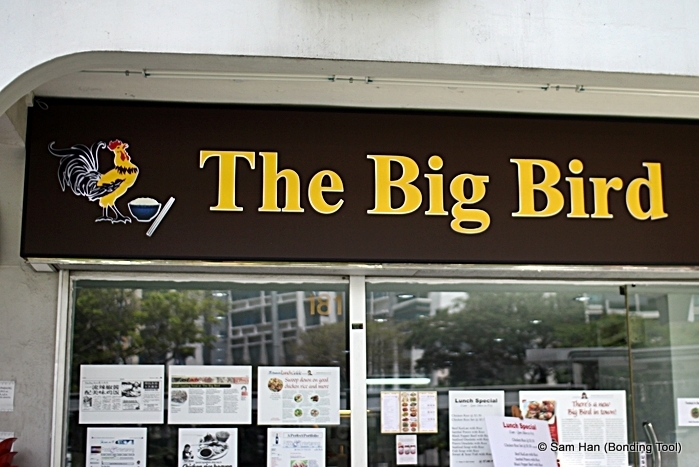 The almost 4 month old Big Bird Chicken Rice outlet at 181 Thomson Road, Goldhill Centre, Singapore 307627. 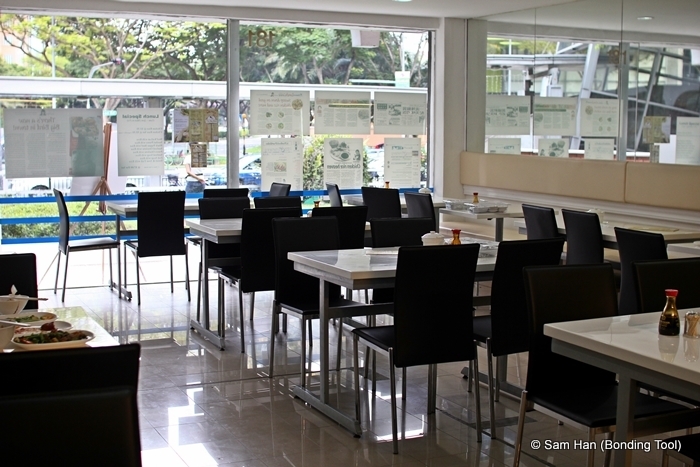 In mid November 2012, another outlet was opened and operated at the helm of Shawn Chen. 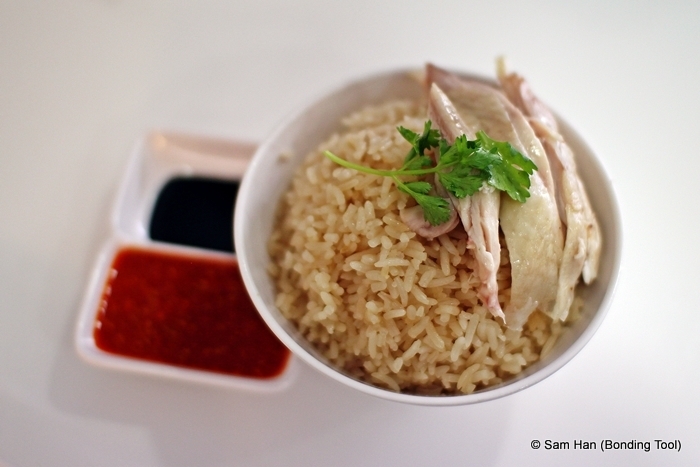 Needless to say the first dish served was the famous chicken rice and its infamous fiery hot chilli sauce. 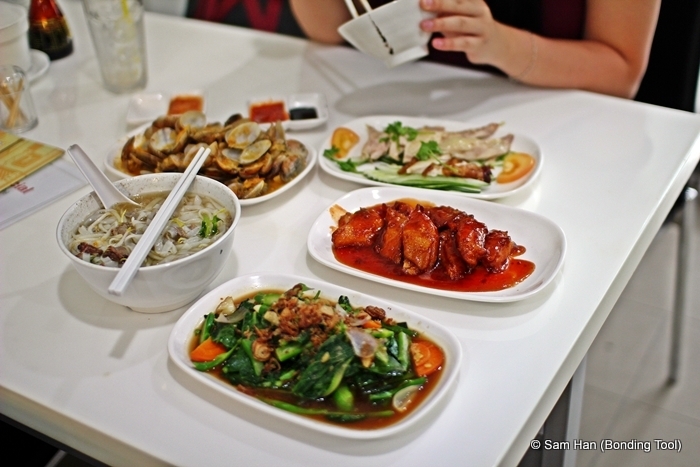 Many customers come here for the fiery hot chilli (tongue numbing even) which contains well… The white chicken is steamed instead of boiled with 2 special ingredients which Shawn declined to name citing trade secret ingredients. The roast chicken is actually deep-fried with spices such as 5-spice, maltose, light soy, salt and more trade secret ingredients. The rice is very fragrant and not oily at all. The rice is of course cooked in chicken broth, pandan leaves, lemongrass, ginger, garlic, the usual stuff that goes into HCR plus more special ingredients. I can easily have two bowls in one seating. I like to eat mine in a bowl with chopsticks. I would drizzle a little dark soy and chilli onto the rice and mixed it up before woofing it down. 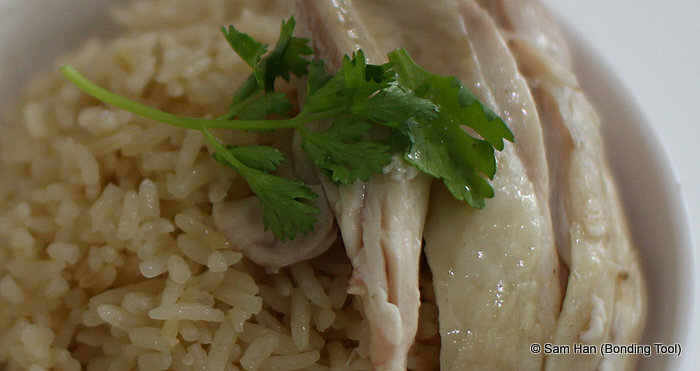 Please note that this is not Hainanese Chicken Rice or Cantonese Chicken Rice. 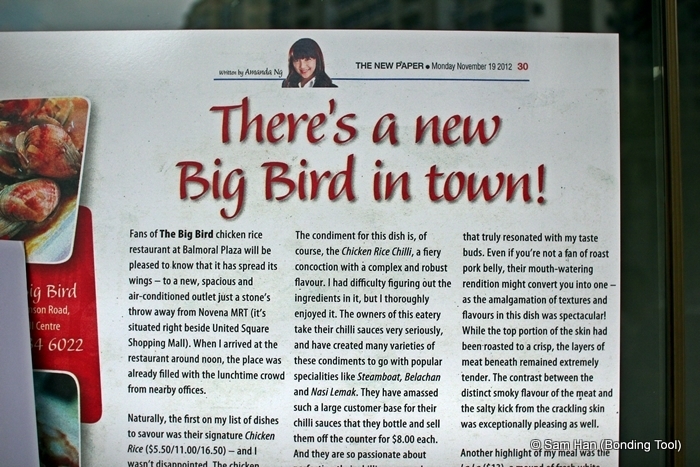 This is The Big Bird’s version of Chicken Rice. Vanessa had her rice in bowl and two types of chicken separately. You may request the rice to be served on a plate with fork and spoon. The next dish served was a steaming hot bowl of Beef Ipoh Kway Teow with 4 types of beef: Golden Coin Muscle, Boneless Short Ribs, Oxtail Meat and Lean Beef. The broth although light and clear was full bodied. The beef stock made of beef bones had been simmered overnight. Derek told me that the golden coin muscle had been slow cooked for 12 hours while the oxtail had been pressured cooked – clearly a winner! This next dish served was something new to me. I have heard some rave reviews from a few friends and decided to give it a go. 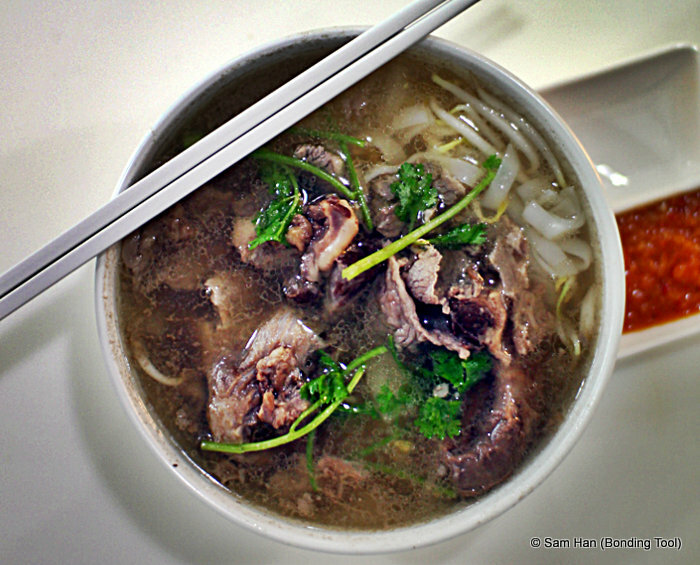 Beef Kway Teow Soup! 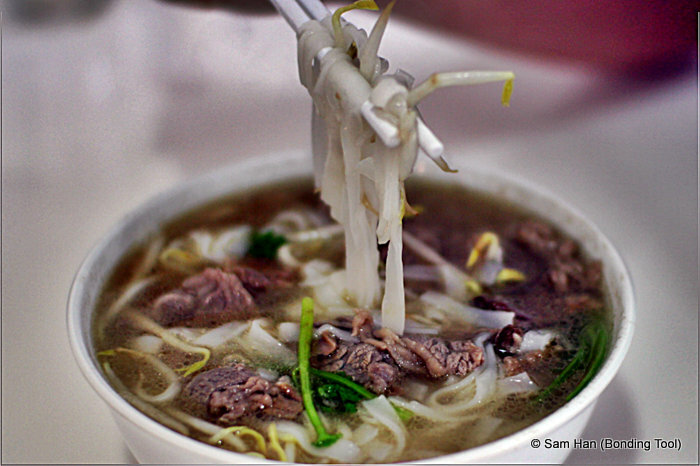 Their flat rice noodles, kway teow, is the thin type of hor fun not unlike those from Ipoh, Malaysia. The texture is slippery smooth. Beansprouts were also added for the extra crunch. They do not blanch the noodles and beansprouts at all. 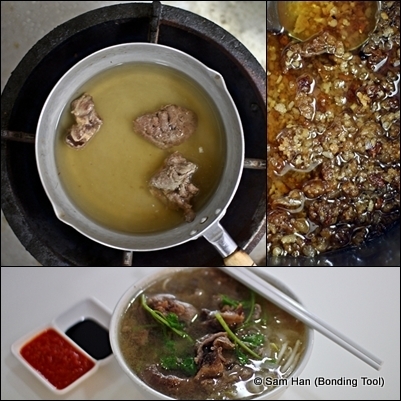 Instead, very hot boiling full bodied beef stock was poured over them. As you can see from the pot above, there were not a drop of oil in the broth. They had been very properly skimmed. 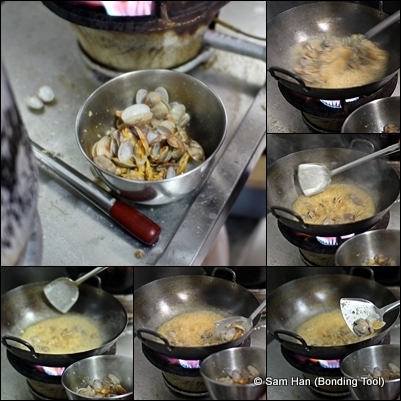 The oil you see later in the bowl actually came from the noodles, since they were not blanched – some oil remained. Otherwise, it would have been a healthier, lesser oil meal. 4 types of beef went into this simple bowl of noodles. Derek divulged that beef bones and some spices were simmered overnight for the very flavoursome stock base. He also used 4 types of cattle meat to serve this dish and hence the premium price of $6.00 per bowl. This dish is available almost daily in the Goldhill outlet but they are only available during the weekends (Fri-Sun) at the Balmoral Plaza flagship shop. Golden Coin Muscle was slow cooked for 12 hours. First meat ingredient: Golden Coin Muscle were stewed in slow cooker for 12 hours until the meat is very tender. I can attest to this as the meat practically melted in my mouth. No tough bits at all. The Golden Coin Muscle or beef hindquarter is perfect for stews and soups. This cut is used more in Chinese cuisine than in Western cuisine. 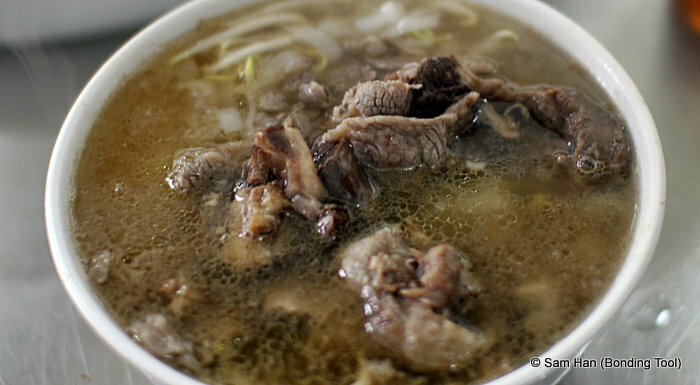 The Golden Coin Muscle has tendon strips that run through the meat which makes it the classic cut for traditional Chinese Niurou Mian (牛肉麵 – beef noodles). Oxtail had been pressure-cooked and meat stripped off the bones afterwards. Second: Oxtail were pressured cooked till tender and the meat falls off the bones. They serve only the meat – no bones in this dish. 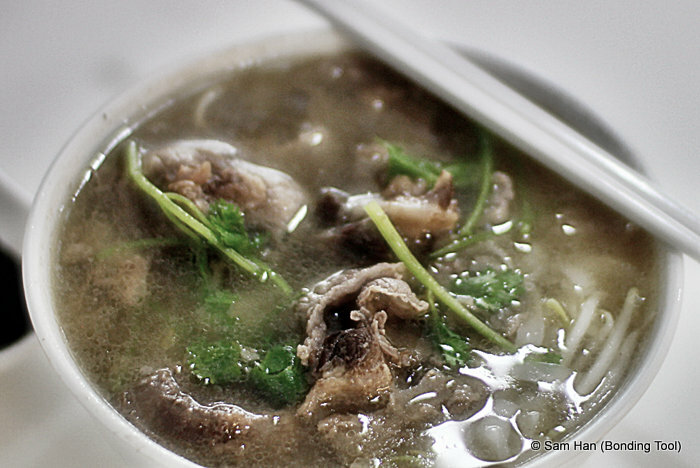 Oxtail is a bony, gelatin-rich meat, and a traditional stock base for soup. Boneless Short Ribs also went into this bowl. Third: Boneless Short Ribs were also on the ingredient list. I have always enjoyed short ribs on the bone in BBQ and this is a quite refreshing change. A bowl I’d gladly received. Boneless Short Ribs are marbled with just the right amount of fat and so full of unctuous, meaty flavor but surprisingly, they weren’t as greasy or oily as the raw meat presented. Lean Beef and smooth Ipoh Kway Teow made up the rest of this savoury dish. Fourth: Lean Beef were added to give some meaty chew and texture but overall, the meats are tender enough to avoid serious jaw exercises. I must agree with my friends that this is a dish that deserves a mention. The clear light savoury broth with a slight hint of msg and citrus tang, crunchy beansprouts, smooth hor fun and tender beef all pushed this dish into the must try list for those who enjoy beef noodles - 牛肉麵 . After studying the ingredients used here, I think SGD6 is justifiable. Heck I paid AUD10 for a sloppy burger with no nutritious soup to boot. Next up was the Chilli La La – small clams with pungent garlic and chilli for kick! Another well known dish is this Garlic Chilli La La. 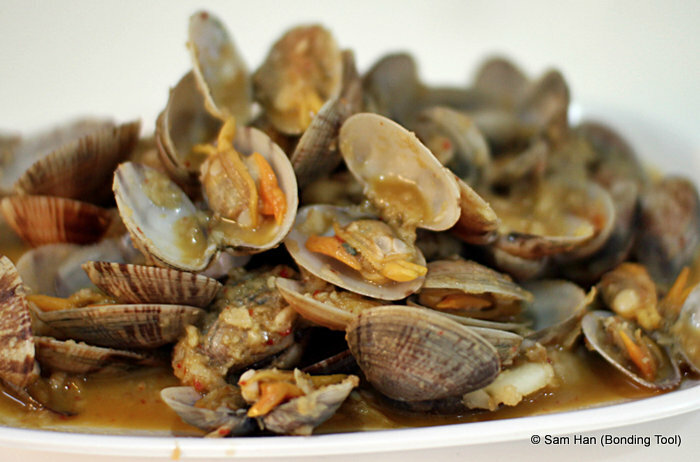 La La clams are also known as Asian Clams as most seafood vendors sell these in Asia, of course. 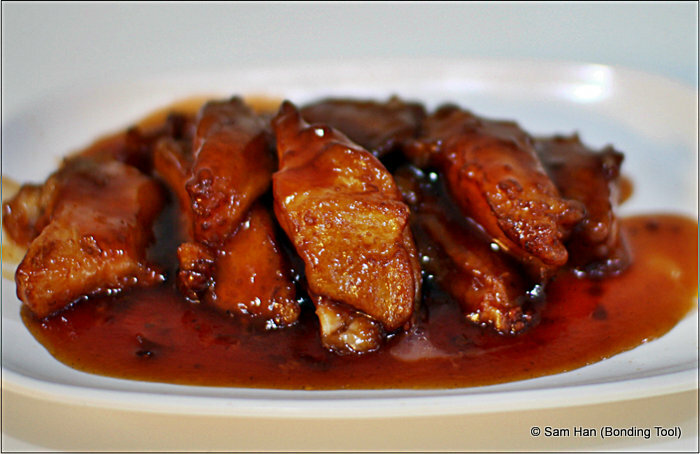 The most common method is to cook them with spicy sambal. The chef here cooked them heavy doused with chopped garlic and chillies. I have provided 2 styles of cooking below. 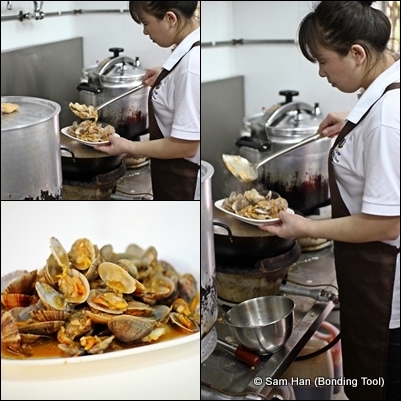 The Chinese Chef stir-frying the clams with deft hands. Every single shell was so fresh you can taste their natural sweetness. As I witnessed her cooking, I was wondering if there would be some unopened ones but there were none. Every clam was “alive”. Garlic and Chilli La La. Vanessa thoroughly enjoyed this dish since we do not cook this in Melbourne, we’ve only had mussels. Shawn whipping his specialty Sweet and Sour Dory. Shawn asked if I have ever tried their Sweet and Sour Fish and I replied no. He then dutifully went to the chiller and got out a Dory fillet. Usually served with Mixed Vegetables like peas, corn and carrots but Vanessa does not like peas so we opted out. Accordingly to Vanessa, the sweet and sour in the sauce was very well balanced. The fish texture was tender and smooth like a white flesh fish should be. The fish was coated with some cornflour beforehand and shallow-fried till crispy before they were mixed in the house special sauce that has some oyster sauce, pepper, white rice vinegar, tomato ketchup, sugar and sesame oil. It was so good the two of us finished the whole plate. This is not on the main menu but they are on the Lunch Special, “Sweet & Sour Fish with Rice“. Chinese Broccoli with wedges of onions and sliced carrots. 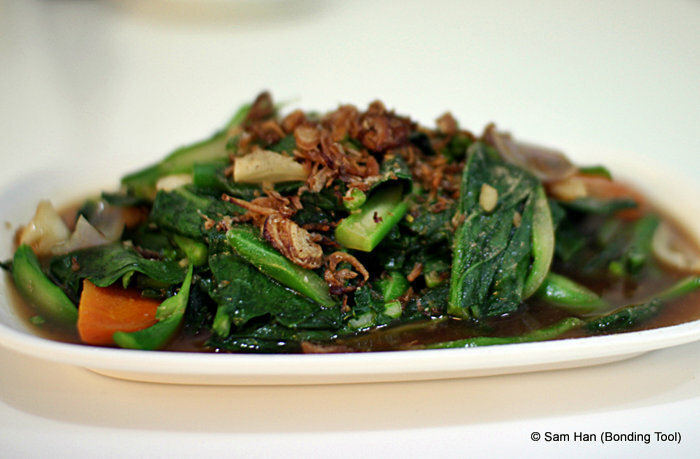 The quintessential Chinese stir-fry vegetables like Kailan (shown above), Bok Choy and Beansprouts are the staple vegetables offered on the menu. 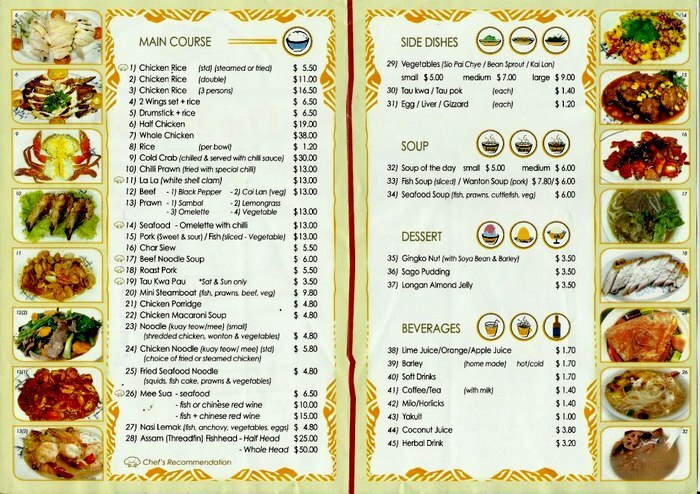 The prices and serving portions of each vegetables differ. The vegetables crunch alright and the oyster sauce was not overpowering. A hint of Hua Tiao Chiew and sesame oil were detected. Dashes of white pepper powder was visible which I supposed was the final garnishing on top of the crispy fried shallots? 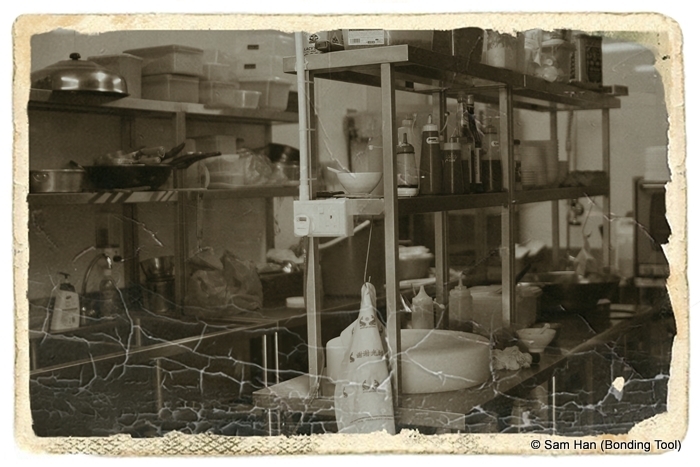 The kitchen environment is clean. The seats are comfortable. The place is air conditioned. The food is good. My visit was at 3pm on a Monday, when the office lunch crowd was over. A family was eating here when I popped in and thereafter several ladies who felt comfortable eating alone came in and were gone after their meal. The air condition was a respite from the hot humid tropical/equatorial weather and I wanted to stay here longer but Vanessa had to go. Good thing the Novena MRT is round the corner. Lunch Specials are only available at the Goldhill outlet – Mondays to Fridays, 11am – 2pm only. Reviews by food critics and journalists gave their thumbs up! A recent review on the new outlet. 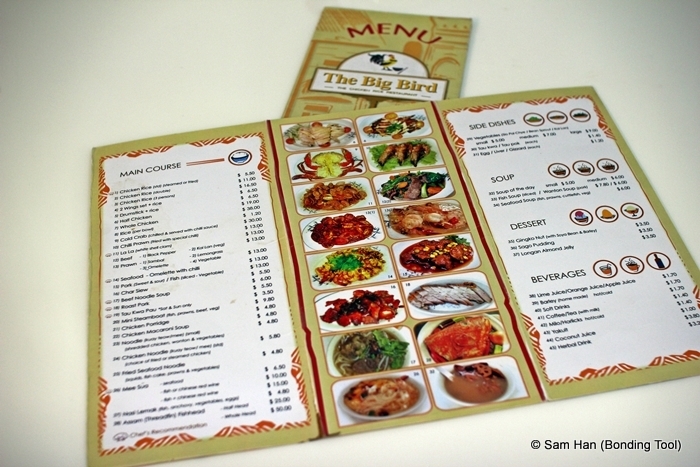 Extensive lunch and dinner menu besides chicken rice at Goldhill outlet. A variety of their home-made sambals and chilli sauces. Vanessa and I liked the sambal/chilli that came with the beef kway teow. That was our new discovery. 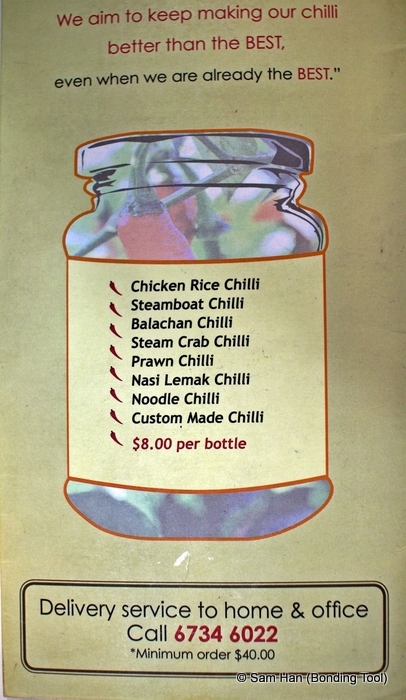 I used to buy the chicken rice chilli back in 2005-2007 when I was living in Jakarta. I used the chilli for nasi goreng (fried rice). I stopped buying because I can’t bring food into Australia. Now that we’re back, we gonna have this tongue teaser pretty often I must say. Father and Son in business together. Where traditional food heritage found its successor. 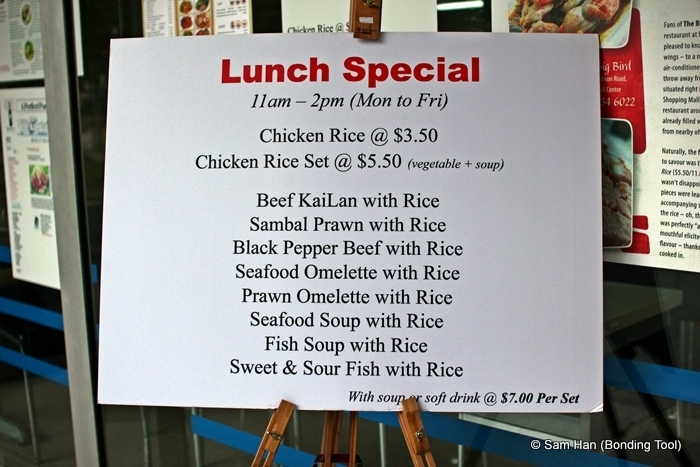 I strongly urge those who work in Goldhill/Novena vicinity to take advantage of the Lunch Special. Sweet & Sour Fish with Rice. If I had 4 chambers in my stomach like a cow, I would have tried Derek’s recommendation of Seafood Omelet. Recipes for Spicy La La. 1kg Clams (La La, Manila, White Clams or the like). Clam Prep: (about 1½ hour). Scrub clams well. Add a pinch of salt in a tub of cool water and soak clams for half an hour. Change water if you see some sand purging out. Change water once and soak again (total one hour). You may keep them in fridge if in Singapore as our weather is humid and hot. Drain well about half an hour before cooking. Some chopped Cilantro and Scallions. 1 tablespoon Taucheo, mashed (Salted Soy Beans). 1 chilli padi, optional (deseeded and minced). 1 slice Old Ginger, julienne. 1-2 tablespoons Groundnut Oil. (Any vegetable oil will do but I like groundnut oil). 2 tablespoons Chinese Rice Wine. ½ tablespoon Sesame Oil, to be drizzle just before scooping out of pan. ½-1 tablespoon Taucheo, mashed (Salted Soy Beans). 2 slices Old Ginger, julienne. Cornstarch/flour solution: 1 teaspoon starch to 1 tablespoon water. Mix well. 1. Heat cooking oil in wok. Add in garlic, shallot, taucheo, salt, sugar, oyster sauce and stir fried until fragrant. 2. Add in clams and stir-fry over high heat. Add the hot water, drizzle wine around the wok to burn off alcohol and bring to a fast boil. 3. Cover wok with lid and let simmer over high heat. Stir occasionally. Clams should be cooked within 5-10 minutes. Another way to tell clams are cooked is when all their shells are wide opened. Discard unopened ones. 4. Add in cornstarch solution to thicken gravy if desired. 5. Add in sesame oil and it’s ready for serving. 1. Reconstitute the dried shrimps in ¼ cup hot water and soak for half an hour. Strain the soaking liquid and keep for later use. Bash the soften shrimps lightly and chop till fine. Set aside. 2. Mix the soaking shrimp liquid with the curry powder to make into a paste. 3. Heat cooking oil in wok. Add in chopped shrimps and stir fried until fragrant. 4. Add in the rest of the seasoning ingredients and fry till aromatic. Add clams and stir-fry for 2 minutes over high heat. 5. Cover wok with lid and let simmer over high heat. Stir occasionally. Clams should be cooked within 5-10 minutes. Another way to tell clams are cooked is when all their shells are wide opened. Discard unopened ones. 6. Add in cornstarch solution to thicken gravy if necessary. The spicy dried shrimps goes very well with plain rice but you may opt for pasta or bread.